You cannot copyright a game – it doesn’t meet the criteria for copyright. So if I decided to make up my own game that is similar to an already published game, that is perfectly ok so long as I don’t infringe on their copyright. 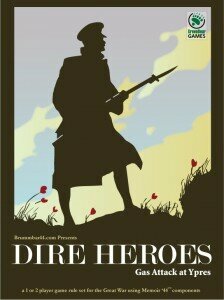 A good example of this was my creation of Dire Heroes. Copyright pertains to the creation of the content itself – I can’t, for example, use the Days of Wonder scenario generator to make a scenario then sell that scenario. Not because it is a Memoir ’44 scenario (more on that in a bit) but because they own the copyright to the images used to make that scenario (well, that and they have you agree to their terms before you can even get the editor to make it in the first place…you’ll note, thanks to my Dire Heroes they’ve added the clause that you won’t make other games with it either now!). However, in theory, I could create my own graphics from scratch and sell the scenarios but then I would have a new problem, Trademarks! Trademarks prevent confusion about brand – So if I made a game, scenarios etc… that don’t violate the copyright, I can still run into trouble here. I can’t pretend to be another brand and must declare even on a mere mention of Memoir ’44 that ‘Memoir ’44 is a Trademark of Days of Wonder’. So as I understand it, I could create, for example, a Memoir ’44 campaign book. All of the content would need to be created entirely by me (I can’t even duplicate any of their existing rules I can only reference them…and declare the trademark). I could then sell it…but the law here is still a little murky and Days of Wonder could still pursue legal action (nothing stopping that anyway)…and I’m not even sure they would win but it just doesn’t seem worth the risk. Honestly, it takes a lot of work to create something like a campaign book and while I might make a few bucks I would likely lose that and more in legal fights. Short answer here, don’t bother. Create content if it’s your passion and simply share it. That’s what I mostly do. The hook here is again, it takes a lot of work to produce something nice and if there is nothing in it other than a community ‘thanks’ (which I do appreciate, it just doesn’t pay my bills) then it likely won’t get done…or not properly. All that being said, I would like to reiterate, this is just my current understanding. If anyone can enlighten me on any of the above professionally, I would love to hear from you. In an effort to share some of the valuable resources I have used over the years I have decided to initiate a library where you can see what books I have and possibly add a copy to your own library. Look for the new link in the Pages along the right hand side. Edit: A quick note to regular visitors…I’ve had to move my website so some things may be out of order in some places. I’m working to not only get it back to regular but also to improve things. I lost my Wave of Steel post so if anyone by chance has the copy please let me know. Well…the time has finally come! It’s been almost 2 years in the making but my vision of a solid, defined re-playable campaign system is being published. My Normandy campaign kicks off after the beach battles. Using the base game only you can play through the Normandy Campaigns. Most of the campaigns are short 2-4 game sittings. You play through as either the Axis or Allies commander (no need to switch sides, a balance mechanism is built in). The outcome of battles determine where you fight next. This is the expansion I have wanted myself for years. So I went ahead and made it. Ive been going through a list of Memoir 44 scenarios, and just looking at each real life encounter of the battle. Makes some interesting reading while I am not able to play 🙂 One of my favorite things about playing memoir is the history, and understanding the circumstances involved in a particular battle. What were the goals, and problem each side faced? Here is a list of some light quick reading I’ve compiled. I hope you enjoy! Omaha Beach is one of the tougher beginner scenarios. The German defenses are quite tough. Given the optimum cards, what strategies would you take as the allies? I picked this gem up over the summer and was instantly impressed with it. This book is amazing for it’s illustrations alone (I wish I could post some of them here…truly brilliant!). 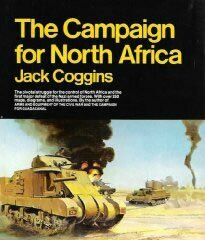 There are a number of hand drawn maps of all the action in North Africa by the author himself, Jack Coggins who served in WWII as an artist correspondent. While the book proper picks up with Operation Torch, the author does an excellent visual recap of the events leading up to it with a chonological timeline and maps from Graziani’s advance into Egypt (13/09/40) to the eve of El Alamein (23/10/42). It then continues on into that battle and the pursuit to Tripoli. Then the book really takes off with Operation Torch and all of the action that followed all wonderfully detailed with unit illustrations and data, maps and diagrams. This book is a welcome addition to my library and will be a main resource for any who want an well illustrated understanding of the desert war. The applications for scenario creation in both Memoir ’44 for the upcoming Mediterranean Theater expansion and the existing Tide of Iron, Days of the Fox expansion are obvious. While this book is no longer in print, you can get a copy through AbeBooks (each purchase helps support this website).